Hawkes Nest has 2 units for a party of up to 8. You must have a 4 wheel drive. We will rent at $50.00 per person per day, but have a minimum of $150.00 per day. If you only have 2 people, it would be $75.00 per person. 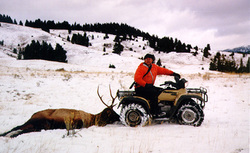 We offer private fishing and excellent hunting and offer discounted rates for fishing season and bow hunting season. Rate discount will depend on size of party and if meals are provided. You can walk 200 yards and elk, deer, antelope, moose or bear hunt. This is also an area that offers excellent locations for bow hunting. Meals will be provided upon request or you can cook for yourself. We are 32 miles from any kind of services such as gas, food, etc. We provide the heat by propane, which is included with rent. Directions: Please contact Bill Mullen (406) 842-5698 for specific directions to the Hawke's Nest. We are 32 miles from any services such as gas or stores. The Hawke's Nest is in a very remote setting and you will need a 4 wheel drive vehicle.